Much as a ripple in a pond reveals a thrown stone, the existence of the mysterious stuff known as dark matter is inferred via its wider cosmic influence. Astronomers cannot see it directly, but its gravity sculpts the birth, shape and movement of galaxies. This makes a discovery from last year all the more unexpected: a weirdly diffuse galaxy that seemed to harbor no dark matter at all. 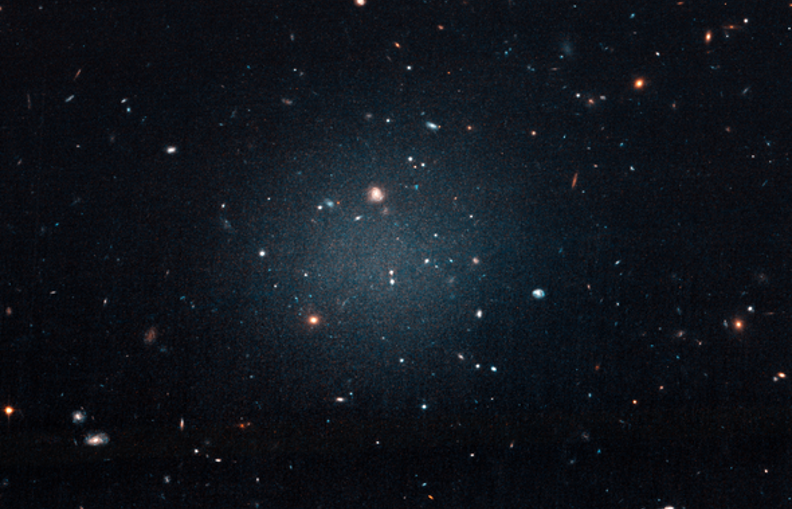 Last March researchers led by Shany Danieli and Pieter van Dokkum of Yale University published a study that sized up NGC 1052-DF2 by observing its starlight as well as the movements of star clusters that surround it. If DF2 contained as much dark matter as astronomers would normally expect for such a galaxy, the dark matter would boost the orbital speeds of those star clusters. But they move sluggishly, which suggests dark matter is absent. Critics countered these star cluster speeds had not been calculated correctly—and, even if the calculations were correct, argued the sample size of just 10 star clusters was too modest for making reliable determinations of DF2’s dark matter inventory. Next, in October, Danieli set out to settle the question using a different technique. She used the Keck Cosmic Web Imager, a new instrument freshly installed behind the giant 10-meter primary mirror of the Keck 2 telescope in Hawaii. The instrument can measure the light from very faint objects at extremely high resolution, making it an ideal instrument for scrutinizing ultradiffuse galaxies such as NGC 1052-DF2. The instrument was so good, in fact, that Danieli no longer needed to study the star cluster motions to infer the galaxy’s mass. Instead, she could get at the mass more directly, using the galaxy’s starlight. In terms of information, starlight contains multitudes. By splitting light into its constituent colors, a practice called spectroscopy, scientists can determine a star’s makeup, age, direction through the cosmos and speed. Much of that information is conveyed in spectral lines—linear features embedded in a star’s spectrum due to the emission or absorption of various chemical elements. The Keck instrument measured the spectra for roughly 10 million stars in the DF2 galaxy. The size of the spread between the fastest and slowest stars in the galaxy gives an idea of how much matter interacts with them. The more matter present—dark or otherwise—the greater the spread in the stellar velocities. “To our own surprise, we measured extremely narrow [spectral] lines, which leaves very little room for more mass other than the mass contributed by the stars in the galaxy,” Danieli says. No room for dark matter. Meanwhile, Eric Emsellem of the European Southern Observatory and colleagues were scrutinizing the galaxy using the Very Large Telescope in Chile’s Atacama desert. They also found a low-velocity dispersion, which supports the missing dark matter scenario. Danieli presented her new findings at a dark matter conference last week at Princeton University, and has submitted them to The Astrophysical Journal Letters for peer-reviewed publication. In a separate paper she describes the DF4 galaxy, which she and several colleagues observed with the Hubble Space Telescope last year. Examining seven star clusters orbiting DF4, Danieli and her co-workers found they are moving languidly, suggesting there is very little or no dark matter in the galaxy. Taken together, the near back-to-back discovery of DF2 and DF4 lurking in the same patch of sky implies a whole class of such dark matter–poor galaxies exists, she says. Several astronomers are scratching their heads over how such galaxies could form in the first place, and where the dark matter went. One possibility is the gravitational pull of a much larger galaxy nearby stripped off the dark matter, Boylan-Kolchin says. Or DF2 and DF4 may not be galaxies after all, just modest collections of stars masquerading as such; in that case, these isolated groups of stars may have formed from colliding jets of gas streaming from another location. Or there could be more humdrum scenarios such as the galaxies’ orientation with respect to Earth being unfavorable for obtaining accurate spectral measurements of their motions, according to Martin. “I’m a little torn about the system. It’s certainly intriguing and it needs to be explained, but it could well be that the explanation is quite mundane, and it’s just the wrong angle or something like that,” he says. One thing is clear: If confirmed beyond a reasonable doubt, the galaxies’ lack of dark matter would conclusively show the stuff is separable from stars, gas, dust and other regular matter, and would further bolster the case for dark matter’s existence. To date, nobody has definitively detected dark matter despite decades of ardent searching. The absence of evidence has led some astrophysicists to search for alternative ways to sculpt galaxies and dictate their motions by developing classes of hypotheses with names like “emergent gravity” and “modified Newtonian dynamics.” Proponents of such ideas argue the sculpting most astronomers attribute to dark matter may actually be a phenomenon that arises from physics we cannot yet comprehend. But if that were the case, those conditions would obtain everywhere. Galaxies like NCG 1052 DF2 and DF4 would be subject to those alternative gravities, too—and those theories would need to somehow explain such galactic oddities (which they presently do not). And so the galaxies’ sheer peculiarity suggests these alternatives are wrong, and dark matter must indeed be the cause. More definitive answers could come soon; Danieli says the team is now looking for other dark matter–free dwarf galaxies. “It may be that these objects tell us something about the nature of dark matter, but it’s too soon to tell. That’s certainly our hope, but we first need to find more objects and study them in greater detail,” she says. Rebecca Boyle is an award-winning freelance journalist based in St. Louis, Mo. She is a contributing writer for the Atlantic, and her work regularly appears in New Scientist, Wired, Popular Science and other publications and has been anthologized in the Best American Science and Nature Writing series.